The Byzantine Monastery of Parigoritissa is in the centre of the city of Arta. It is about the most important byzanitne monument of Arta, a masterpiece of byzantine art built in basilica archtitecture. It was built between the years 1283 – 1296 and opened as a monastery for the women. 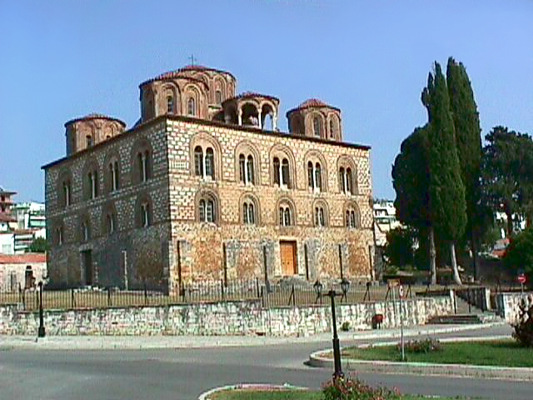 The monastery was built on the ruins of an ancient temple by Nikoforos I Komninos the Duke and his wife Anna Palaiologina Kantakouzini. The architecture of the temple, the wallpaintings, its sculptures, the magnificent dome and generally the inside and outside decoration, are an excellent sample of the age of the Despotate of Epirus. This splendid church is dedicated to the Annunciation. For the history of the church there are many details in various book editions and papers. From the old monastery for women, have been saved: The church, the Altar, 16 cells and the Dining Hall (dining room) which has been reconstructed and houses findings from the ancient Amvrakia. The monastery has been characterised preservable and is open to the public as a museum. It belong to the Ephorate VIII of Antiquities.